Imagine an ancient, robust structure that could comfortably hold an untold number of people, then was suddenly abandoned for no discernible reason… Actually, I was referring to the old Kingdome in Seattle. The only difference between that and Machu Picchu is the Incas had not yet discovered dynamite. Since I had some free time towards the end of my Lima stay, I decided to book a tour to see this city of the clouds. According to the Peruvians, the place was voted one of the top ten historical wonders of the world (I tried to ask where the Space Needle finished in the balloting, but it appears to have ended up well out of the top twenty). At least there are plenty of touristy restaurants to choose from in Cuzco (and by this I mean the menus are in both English and Spanish). While enjoying a dish of raw trout marinated in lime & chili sauce, some fellow Americans came in and asked the hard-working waitress for the vegetarian menu. Now, I have nothing against those who choose not to eat meat for health reasons. Both my grandfathers consumed beef and pork their entire lives and paid the price, tragically passing away at the ages of ninety-two and eighty-eight. From this, I am painfully aware that my own carnivorous lifestyle will likely preclude my ever celebrating a ninety-fifth birthday. (Too bad, I really had hoped to see the Washington State Cougars in a major bowl game one more time.) What I don’t agree with are the people who travel the world and expect the local cuisine to align with their gastric convictions. I call this behavior The Ugly Vegetarian and always keep my distance. Fortunately, these kind of tourists do not frequent my beloved McDonalds, so contact is rare. 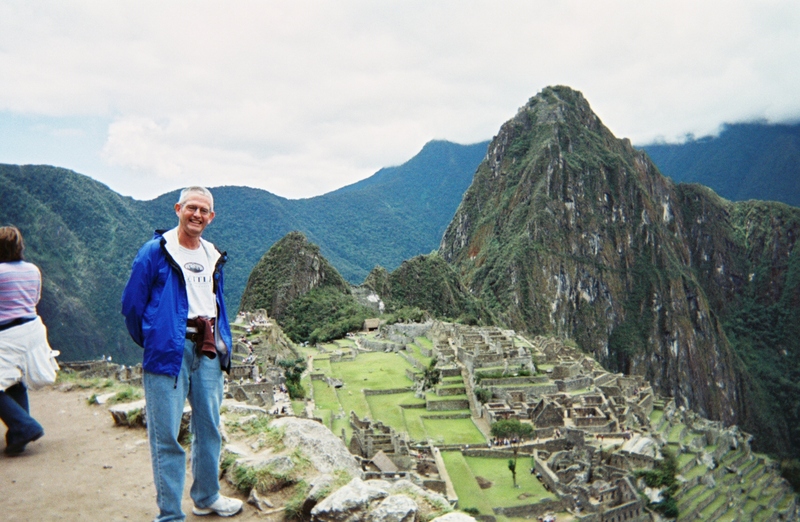 From Cuzco to Machu Picchu, it is necessary to hop on a train for four and a half hours. The scenery gradually mutates from a dry brown to lush green as the engine labors its way into the mountains. I passed the time by inflicting my Spanish on a friendly engineer from Columbia, who reminded me of a former co-worker whose Spanish invectives directed at IBM served as my introduction to the language. When the train finally arrives at its destination, the tourists disembark and run the gauntlet of trinket stands to board a bus for the final leg. With the vehicle navigating through an endless series of switchbacks, you see the neighboring steep cliffs rising along with you and wonder how the Incas ever climbed this high on their own, much less how they managed to built such a remarkable site. Since the history of Machu Picchu contains a lot of conjecture, the tour guide there stuck to the basics, pointing out the temple, sun dial, garden, residential areas, etc. Most of us were only half paying attention, instead admiring the breathtaking (pun intended) views. Clearly not a place for someone suffering from acrophobia. One of the more interesting experiences was a large rock used for personal healing. By stepping up with your left leg first, then touching the stone with both hands, you could draw from it’s resolute strength. When I tried this, I ended up bumping my knee, though the pain did quickly recede. Despite the lack of hard knowledge, one cannot help but speculate about why this place was abandoned. According to our guide, the latest theory is that long ago, Machu Picchu had a franchise in the Inca Basketball Association (IBA). The team, known as the Jumping Beans, demanded a new sports temple with luxury stone suits in order to keep pace with the rest of the league. When the Machu Picchu Tribal Council refused, the team moved upstream to Quillabamba and subsequently won two consecutive Lima Trail Championships. With the loss of an IBA franchise, Machu Picchu was no longer considered a “big league” town and began an inevitable, irreversible decline. Those in Seattle who are opposing the Sonic´s multi million dollar demands for a new arena should take heed. Candidate city for an NBA franchise.